Some people cannot have a peopled life. We try for it. We go to markets, and say hello. We help to bring the hay in, and pick the cider apples from their bee-noisy trees, but it takes very little—a hare, or a strange moon—for hag to come. Whore. They raise an eyebrow, then. They call for ropes to bind us, so that we grow so sad and afraid for our small lives that we turn to empty places—and that makes them call hag even more. She lives on her own. Walks in shadows, I hear … But where else is safe? These are the words of Corrag, a suspected witch imprisoned and awaiting execution for interfering with the Glencoe Massacre, in which the MacDonald clan was killed for their delay in pledging allegiance to King William III. Corrag tells her story to Charles Leslie, a minister from Ireland with sympathies for the exiled King James. Leslie has come to the Scottish Highlands to search for evidence that William himself ordered the massacre, and the trail quickly leads him to this strange woman who tells him the story not just of the massacre, but of her whole life in Corrag, the new novel by Susan Fletcher. Most of the book is made up of Corrag’s life story, with letters from Leslie to his wife inserted between the chapters. Corrag has always lived on the fringes of society. Her grandmother and mother were both condemned as witches, and Corrag has escaped their fate by fleeing, on her mother’s command, from their home in England to the north and west, where people are less suspicious. She tells Leslie of her four lives: her early life with her mother, her life on the road to the Highlands, her life in the Highlands, and her life in prison. As he listens, Leslie moves from a position of condemnation to one of compassion, as revealed in his letters to his wife. The basic story of a woman condemned for being different is nothing new, nor is the story of someone’s eyes being opened by listening to a different voice. But Fletcher’s writing lifts this book to something more than the pedestrian tale of a woman ahead of her time fighting ignorance. For one thing, the characters themselves are well drawn and develop in believable ways. 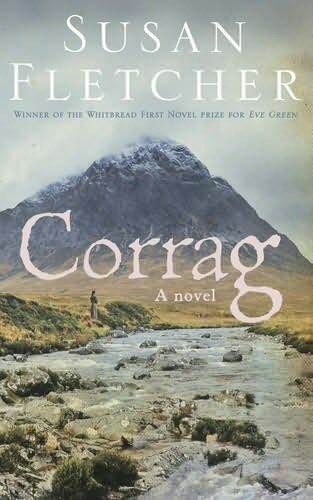 Corrag is a bit too perfect and knowing perhaps, but as we read her life story, we get to see her grow into her wisdom. It’s not just something that comes from being female and earthy. She learns—and sometimes unlearns—from life and from her encounters with others. Even better is seeing Leslie grow in his understanding in a way that doesn’t mean throwing off all his old ideals. And Fletcher reveals his growth in what amounts to a very small amount of text—just a few letters of no more than three pages each. I also liked the way the story unfolded. Even though I knew the gist of what was going to happen—when the novel opens, the massacre is over—I still felt some suspense as I wondered how it would turn out for the individuals Corrag knew and what her place would be in the events. And there were even a few surprises in that the story didn’t always go quite in the direction that I expected. Fletcher’s use of language is also impressive. She gives each character a clear and distinctive voice. Leslie writes in a clear and straightforward style, but Corrag speaks in a poetic and meandering style. The flowery language Corrag uses is quite well-done. A lot of fiction that aspires to be literary uses metaphor and imagery that sounds pretty but falls apart if you think about it at all, but Fletcher does not employ such clunky language. Some readers might not care for Fletcher’s poetic style, but it worked for me because it suited the characters. Although I generally admired Fletcher’s use of language, I do think this book would be much stronger if she had held back at times. Corrag has a tendency to repeat certain phrases and return to certain images again and again. This did seem true to character, but it made for tedious reading at times. Judicious trimming of the constant reminders that her mother warned her against love or that she desired to save lives would have been an improvement, I think. The imagery she uses is so evocative that it doesn’t need to be repeated quite so much to make an impact. This is Fletcher’s third novel. Her first, Eve Green, won the Whitbread first novel reward, and I believe her second, Oystercatchers, is highly regarded as well. If you’ve read them, I’d love to hear what you thought. Corrag has just been released in the U.K. and will not be available in the U.S. until November. It is, however, available through The Book Depository for U.S. readers who just can’t wait. This book sounds fabulous. I must add it to my wishlist! Katy: It is very good. I hope you enjoy it! This sounds really intriguing. Thanks for the wonderful review – I’ll look out for this author. litlove: You’re welcome. Fletcher’s other books are apparently modern, but they look good as well. I love the language of the book too. Fletcher has this way with images. It’s an intensely *visual* book. It has been ages since I read something where I felt I could actually taste, smell, see everything so vividly. I know what you mean about the repetitiveness of some phrases, but it doesn’t bother me so much. I feel like it’s a function of Corrag’s character: she doesn’t know very much, her experience is so limited, but she knows some things intensely. Her life has run in quite narrow but strong emotional channels, and it seems right to me that she should fixate on the few pearls of wisdom she has learnt. Saying that, there is a devil on my shoulder telling me that the book is very cliched in terms of character and theme: the misunderstood witch and the misunderstood Highlanders, and the misplaced prejudice of Charles. I’ve yet to decide whether or not I like it because it’s beautifully written or because it is saying something beautiful. Victoria: I understand what you mean about the repetitiveness being part of Corrag’s character. For me, though, it was still a little too much. But that’s a minor problem, really, when the rest is so well-done. I do think the devil on your shoulder makes a fair point about the cliched characters and theme. This certainly isn’t a new story, nor are the characters particularly original, but I think Fletcher’s writing takes this old story to a new level. And I also appreciated that not every character followed the exact arc that you find in so much popular fiction. Not every “witch” is pure, balanced, and wise; not every man of God is a villain (nor does he have to abandon God to be enlightened); and not every soldier is a monster. It varied just enough from the usual direction to work for me. I do look forward to seeing your review and finding out which side of the fence you end up on. I’m just about to start reading it, so I’ll pop back when I’ve read a chunk! Annabel: I hope you enjoy it, and I’m eager to hear what you think of it. Oh, I just LOVED this book! I was completely mesmorised by the language and sense of place. It’s one of those books that I could read again and again. I have a review and an author interview with Susan Fletcher on my blog – I hope you don’t mind me posting the link for anyone who is interested in knowing more about how the author wrote the book. Book Whisperer: Thanks so much for the link. I was glad to learn more about Fletcher’s creative process here. And yes, the language and sense of place are just remarkable. I have a copy of this but haven’t read it yet. I wasn’t convinced by the premise but your review has persuaded me to pick it up. I look forward to trying it! Jackie: I’ll be very interested to hear what you think of this. I know you tend to require more plot in your books than I do, and I wonder if this story will have more meandering contemplation than you’d like. I thought the story was terrific, and there was plenty of it for my tastes, but I can see where others might lose patience. Oh, I want to read this. Don’t know if I can wait ’til November. May have to visit the B.D. Gavin: I don’t know what I’d do without the Book Depository sometimes. MAJOR SPOILER IF NOT BEEN READ YET! BE WARNED! Just finished reading it………i ve always been fascinated with glencoe and its past from a young age, and this book struck me as soon as i saw the cover. I love the way it was written, and how she built up a friendship with the minister from ireland, how he warms to her. I was totally enthralled and needed to know who survived at the end and escaped the soldiers. The book actually took me there as it happened, it felt as if i was stood there amidst the choas of the massacre and with corrag as she explored the mountains collecting her plants and tending her animals. It was so moving as though she had feelings for alisdair, she would keep telling herself not to love, and when she was helping bring sarahs child into the world, i was almost in tears. I suppose like corrag i feel as if glencoe is my home and even though i too am english if i had the opportunity to go there for rest of my life …I would. My heart was actually racing from the point of corrag trying to get help for the macdonalds who took her as a friend though they were described as babarious and fighters. I was so relieved in the book when i read sarah and the child fleed to safety (the motherly touch in me as i have young child too). The fact that the minister was moved to steal the file from the blacksmith and spare corrags life at the end was so amazing and bought a huge smile to my face, as though what goes around comes back round. The fact she saved the lifes and bloodline of the MacDonalds of Glencoe, and in turn she was saved and allowed to return to glencoe and live out her life to a ripe old age, where she belonged. I feel a huge connection with Corrag. I am now actually dying to know how the clan managed to get back on track that august when they returned to the valley and start again, and corrags further involvements in their lives, what became of Gormshuill? and many many more things. All in all I’m going to buy it in paperback next year, as i borrowed this copy from the library, and I truly hope she does a sequel to this amazing tale. I’m glad you enjoyed it so much! I wonder if there will be a sequel.